A very long productive week on site was a huge improvement on the frustrating fortnight of rain that preceded it. Education rose up from the ground very quickly, we finally managed to pour the foundations for the water tower, and work started on the Prenatal Clinic and Administration roof. • Our largest workforce on site to date and by far the longest week, with many days working from 7am till 6pm and the team choosing to work through Sunday too. Everyone is invested in the project and wanted to make the most of the drier weather. • The Education block work came up quickly, after we pumped three feet of water out of the foundation trenches. • Almost all week there was a team repairing the excavations for the water tower and pulling bucket after bucket of mud out. It was a real relief to finally pour the concrete for those foundations for everyone involved. Pumping rain water out of the trenches. The walls of the Education Building rise. • The Second Mile truck has had a rough time constantly heaving huge quantities to site every day, especially with the condition of the road following the rain. This has been improved through better covered storage on site, and keeping security through the night enabling us to transport larger quantities at one time. • The team of carpenters has increased, and we intend to make fast progress on the roof over Administration and the Prenatal Clinic. • We hope to start both the electrics and the plumbing across the site. • The Kitchen area will be marked out and the foundations poured for that building and the surrounding terrace. • With the dry ground some basic landscaping to connect the different buildings will help the general masterplan. The continuing rain has caused further challenges with work regularly having to halt mid afternoon. The last lintels have been poured for the windows, and the remaining block work is in progress. Meanwhile the rebar workers have got ahead with preparation for the water tower and the front columns of Prenatal. Unfortunately this is the first week we have not worked six days, the heavy rain led to us closing site in the hope it could dry up a little over the weekend. • The cement render work is moving forward continuously and there is still a large team on site working with the concrete. • A temporary roof is being erected above administration to protect materials within and allow overnight security to keep an eye on things. • The first blocks started to be laid for education, with an innovative technique of blocks being used to form reinforced columns, being used to enable fast and efficient building. • The rain has caused a number of issues on site: cement render has been washed off walls after a days work to fix it; the education foundations have filled with water before enough blocks could be laid; and the entire site has a mixture of thick mud and standing water. • Understandably the lead contractor has been concerned that his labour contract is being somewhat wasted as often only a half days work is possible, and all the workers will expect a full days pay. • Transporting materials from New Start to Strong Start has been difficult, and it has been difficult to balance keeping materials dry and not having to pass the route to many times daily. • With no clear sign of the rain stopping, we will need to adopt some alternative strategies, such as temporary coverings for some buildings and for material storage on site. We also hope to hire a water pump to enable us to proceed with the currently flooded foundations of Education and the water tower. • The timber roof has drifted behind schedule and we need to start this coming week to make up time. Regular rain and heavy flooding has had a (dampening..) effect on site progress. The road to site has been more difficult to pass on foot, and site is becoming more bog like. Nevertheless, materials have kept arriving thanks to a good relationship with a local truck driver whilst the workers have taken to a shorter route to work, regardless of the fact it involves taking their pants off and wading across a canal. Despite the regular rain, we still have 30 workers on average toiling away daily, and we continue to move forward. • Meanwhile another team of masons have started to cement render the administration building, and are producing a very good finish. 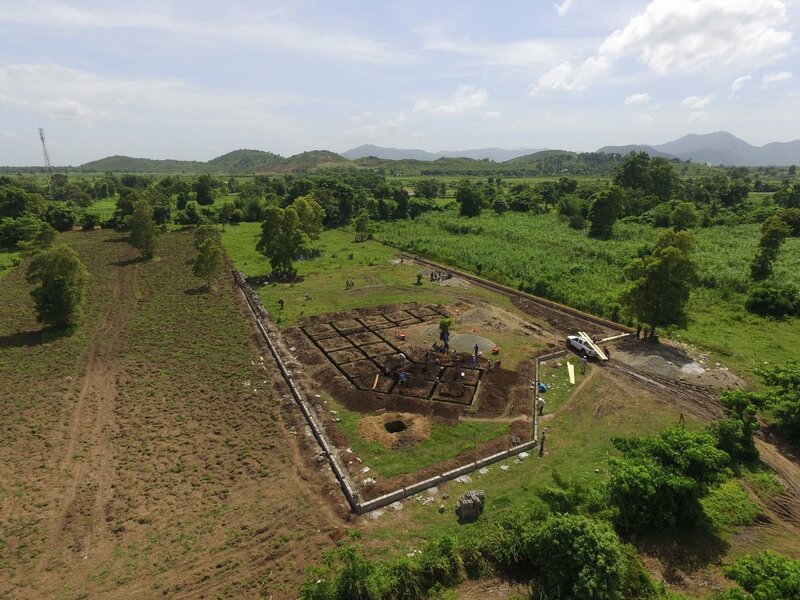 • The foundations for education are now complete, which took a little more time due to some different construction strategies required because this is a larger span building. • The front gate to Second Mile has been completed, allowing the front of the property to be sealed off, whilst the rear has had a line of cactus planted to eventually grow into a barrier there. We are mixing a huge amount of concrete each week, but the last few weeks have seemed relatively slow, purely down to the sheer amount required. The volunteer engineer partnering remotely from the UK on the project has been very busy, which has slowed down some decision making. • The water tower foundations have been excavated, but unfortunately have flooded and will need to dry out fully before any further work can take place. The water table has risen after so much rain, making any further excavation very difficult. • Assuming the rain continues to fall in the late afternoon and evenings, we should be able to maintain progress. We hope to get to a point where we can start the Prenatal roof later this week or right at the beginning of next week. • The water table being so high means no further buildings will be excavated as we need the soil to dry out to some extent. • The education walls and columns should move pretty fast now we have the foundations cast, we hope to arrive at eaves level by the end of the week. All the concrete floor slabs have now been poured, so the internal spaces are quickly taking shape, whilst the hollow block walls were filled with concrete to reach their full strength. A time consuming week of concrete mixing, the team worked through two national holidays in the middle of the week. There was good progress, however the satisfaction was marred by the arrival of rainy season in full force with heavy flooding around Second Mile that will certainly affect progress through November. • The Education building has been fully excavated and the rebar cages are starting to be laid into the foundation trenches. With the repeatability of many of the construction standards, it is good to see how familiar many of the builders are becoming with the standards required of them. • The concrete slabs being poured before rainy season properly started is a real success, as they would be especially difficult to pour in rain. • As I was off to the Dominican for the weekend, Jenn was leaving for the US - it was very satisfying how organised we were in arranging for all the materials for the 10 days we could not purchase materials together. The funding is continuing to sustain good pace on the project. 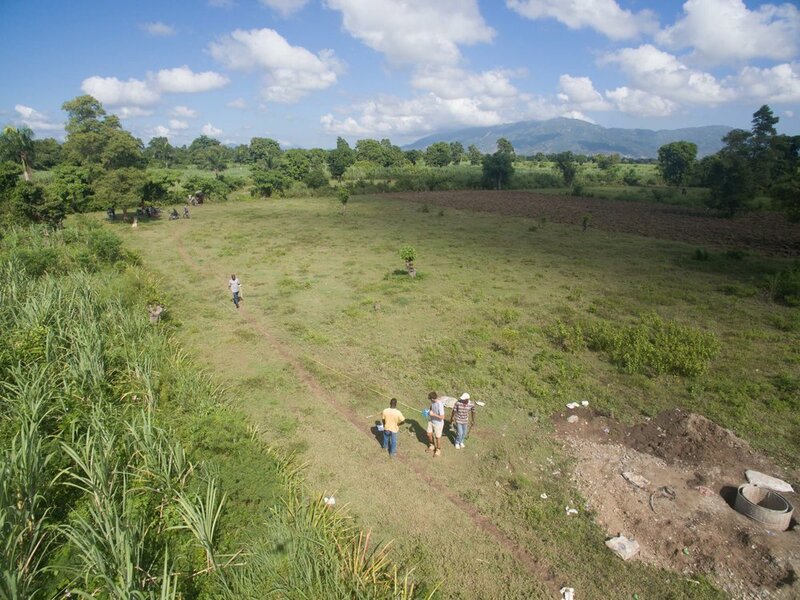 • Rainy season beginning is always a hard time in Haiti, especially in a rural context. Many roads become harder to pass, deliveries become more difficult and many of our friends and employees suffer regular flooding at home. • The road between New Start (the recovery center) and Strong Start has become very flooded, and it is clear there is still work to be done then. After the improvements to the road we had hoped to mitigate this problem, but evidently there is still progress to be made. • Concrete pouring can be a slow process, and visually there are not huge changes, but things will move quickly once we start on the roof. The concrete pouring will be more difficult in the rain, but we are determined! The education, kitchen and water tower foundations all need to be poured, and then blockwork can start on them. • The lintels above the Prenatal building windows and doors are being made, and then the windows can be measured up and fabricated. • Once the last few block courses are laid above the windows, we can start to fix down the timber wall plates and begin the roof construction, although a large roof, weather dependent, we should remain on schedule to finish in December. The block walls of the Prenatal Clinic have now risen up to the top of the windows, meaning a short pause whilst we prepare to cast concrete lintels. At the same time the floors have been levelled, rebar tied and we are preparing the pour the concrete floor. Elsewhere on the site, a barrier of cacti now walls off the rear of the site, whilst the education building and water tower are midway through excavations. We are rushing to complete all foundation work before the typically wet November month. • Starting another phase of the project and running it alongside the prenatal clinic is exciting to see. The design for the project is coming to life very quickly. A benefit of the repeatable module which has informed the layout of the entire site, means that with each building - less needs to be explained and more seems familiar, so if anything we’re accelerating. • The influx of funds meant we are are able to sustain the rate of progress on site by ordering materials far enough in advance. There have been a few ‘gulp’ moments as we make very large orders, but its exciting to be able to plan ahead and keep the pace going. • It is still difficult to encourage the builders to plan ahead. We have regular situations where a bit of forethought would have prevented a slight pause in work on one process on the site when materials run out. They are working for a lump sum contract, so it is in their interests, as well as ours to keep the project moving forward at a good speed. • With two national holidays this week, there may be a little less progress, however the next 7-10 days on site are all going to be about pouring concrete. We’re eager to get all the groundworks complete before the heavy rains arrive, which means the education centre, kitchen and water tower foundations, as well as the ground slab for all the prenatal clinic. • The walls have now reached above window height, so we need to agree a suitable lintel with the engineer and produce them to a high standard. Work has been going very quickly on the Prenatal clinic, with the block walls now at window cill height. The other team of workers completed the perimeter wall, as the last sections of the ringbeam were cast. The design of the education building, kitchen and water tower were all developed and their budgets calculated for the next phase of building work. The construction strategy - using concrete blocks with reinforcement bar within them, and then filling with concrete - means extremely fast progress that is seeing over 30 people laying blocks together on the site some days. The largest amount we laid in one day was nearly 500 blocks. • Seeing the perimeter wall completed and the site feeling more enclosed has been an exciting step in the progression of the construction site. • At times the progression on site has been so fast that it has been difficult to keep up! Looking ahead to the next stage, whilst also keeping step with the builders on site has been hectic, but the speed of the project progression is very satisfying. • Some material orders could have been made further in advance, but with the next set of funding now here, this should not be an ongoing problem. 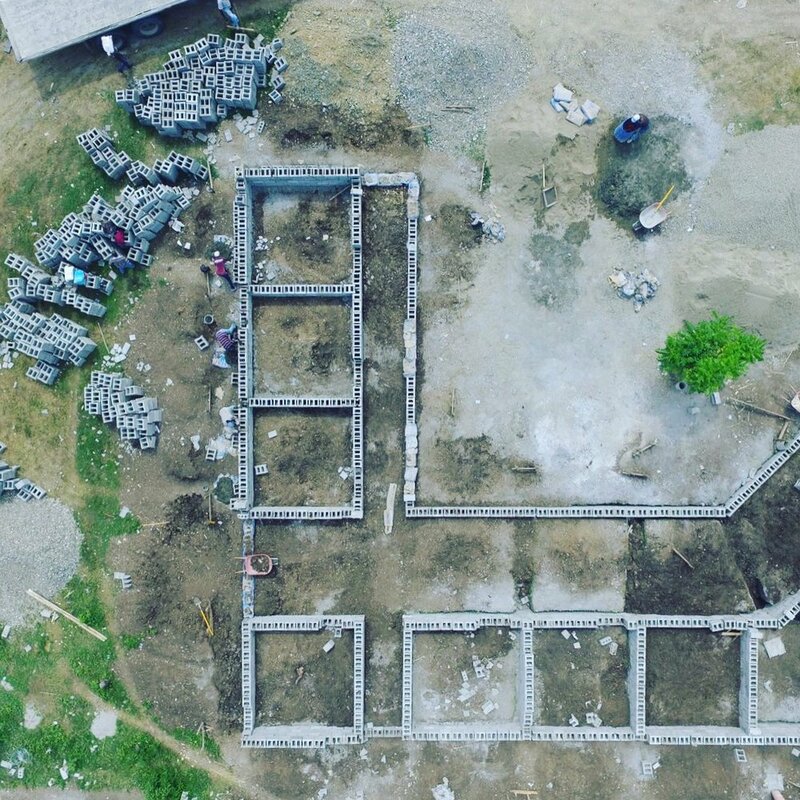 • The next stage of funding now being in Haiti is really exciting for the progression of the project, many other materials can be purchased to ensure there are no delays on site. • With the above ground masonry starting, it was very busy on site this last week, but with the work team settling into a rhythm, we can hopefully move onto the education foundations so that we stay on track with that aspect of the project too. This week has seen some rapid progress across the site. The foundations are almost complete for the prenatal clinic, and at the same time 5 courses of blocks have been laid, bringing us up to floor level across much of the building. Concurrently, the perimeter wall blocks are all laid, and preparations are now being made for the columns. • After a lot of time calculating estimates, balancing the budget and cost engineering the budget is looking more feasible. • The tradesmen from both the local community and further afield working well together and sharing knowledge and skills from their experiences working with me on previous projects. • The beginning of a project involves a lot of large material orders, getting our procurement routes established and managing cash flow is gradually becoming easier, but still presents some challenges. • Continue to cost engineer and find reductions in the budget, prioritizing quality of work and materials, but looking to make efficiency savings. We have started pouring concrete for the phase 1 foundations, whilst the perimeter wall reinforcement ring beam is cast. The quote for the total cost of the clinic and administration came in, as with many construction tenders- high. • We are on schedule with Phase 1, I have been able to spend more time off site working on the next stages and planning budgets, whilst the construction workers take control and responsibility. The quality of work has been good, and comprehension of the bigger picture, personally a satisfying process having worked with the same tradesmen for nearly a year. • The perimeter wall continues to fly up, and we are ahead of budget on that front. • The total construction tender was good quality, and included the vast majority of materials, unusual in Haiti. • Heavy rainfall has resulted in a lot of mud along the route to site and inside the compound. Fortunately this is drying off quick, and has been at night therefore not particularly affecting progress. We have put plenty of gravel down on the route into the site, to prevent any access issues later in rainy season. • A very high estimate from the builder has resulted in some panic, and worry about the effect on the latter phases this fall. A serious cost engineering exercise to get us back nearer the total budget has been productive and we are getting there. • Purchase the blocks and start laying them for Phase 1. • Quality control perimeter wall and ensure good block laying practices are in place. A contract was agreed for the foundations of Phase 1, and foundation digging is complete. Meanwhile the other team of workers are moving forward quickly with the perimeter wall. Site has been very busy and it has been exciting seeing the overall layout take shape. We expect to have Phase 1 finished up to floor level including a concrete slab in under four weeks from now. • The excavations for the Prenatal clinic are nearly complete and the reinforcement bar cages are well underway. • The foundations for the perimeter wall has been cast, and the masons are fast building up the wall. • Over 40 people have been on site every day, and there is a really buzz around the site, with the builders from the local community getting on well with the new contractor managing the clinic. • We are continuing to document the project with a drone which is allowing a great overview of the fast growth of the site. • The initial survey we did of the site was fairly approximate, so adapting the masterplan so that we can maintain the trees and do not have buildings too close to the external wall is taking some time. • Keep pushing progress on the perimeter wall, plant a line of cacti at the back of the site, and design the front gate. • Pour all the concrete foundations for the prenatal clinic, and order the blocks to start on the walls. • Agree on the final costs for total construction of the Prenatal, and use to update estimated costs for subsequent phases. • Mark out the education centre. The priority this week has been to have the drawings and descriptions of the standard of work required, complete to the point where the contractor can start pricing the first phase Prenatal Clinic and Administration buildings. At the same time we’ve been organising the digging of a well on the new site, and spoken to the local community about building the perimeter wall. • Award winning structural engineers Webb Yates have agreed to do the structural design and consultation for the project pro bono. • Good progress has been made on the new well after some initial hiccups. • The construction schedule of work and drawings are complete and the project is being priced by the contractor/ Bosses. • Some very useful feedback from Grace, Jenn and SM’s wider advisors on the Birthing Centre led to some good design changes. • A mason from the local area is calculating the costs of the perimeter wall, with blocks to be made by the local community. • Tackling balance between getting the project moving, but wanting to have the right contractor at the right price for the right quality. • Managing expectations and wanting to get started on site, but lots of leg work to get there. • Getting the perimeter wall costed accurately, by builders used to just being paid as they go.